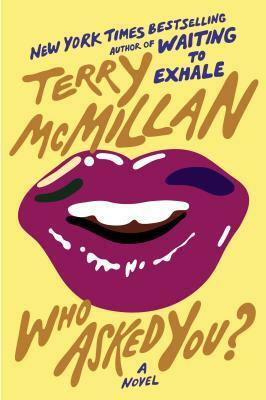 Terry McMillan has recently released her latest novel, Who Asked You?, which centers around matriarch, Betty Jean, and her relationships with her family and neighbors. When I discovered Terry was coming out with a new book, I jumped at the chance to get my hands on it. Let me be real here, Waiting to Exhale is one of my favorite books, and I absolutely loved A Day Late and a Dollar Short. I knew I wouldn’t be disappointed with this one. A quick rundown in case you haven’t heard a thang about this book: Again, this novel centers around Betty Jean. Not to tell too much, she is forced to raise her grandsons, Ricky and Luther, while also caring for her sick husband, after her daughter drops them off and disappears. We all know this can’t be easy, and readers read all about how Betty Jean manages to keep it all together and raise these boys. Betty Jean also has to deal with her sister, Arlene, who is a big ol’ hypocrite, and her baby sister, Venetia, who believes she is living a picture perfect life (we all know that ain’t so, Porsha on the Housewives show thought the same thing). From this book, readers realize we all go through issues, and somehow, we can make it to the other side with our sanity intact. If you can’t tell it, I will say it here: I enjoyed this book. In many ways it reminded me of The Twelve Tribes of Hattie, as it centered around a matriarch who tried to give her children what they needed. Despite our best efforts, sometimes folks will do what they want to do, whether it’s right or wrong. As always with a Terry book, it was easy to read, flowed very well and the characters were likable, even that ol’ crazy Arlene. Also, I have to add here, Nurse Kim….chile, if you don’t get nothing else out of this book, Nurse Kim told the truth, with her nasty self. Lol. Sorry, but I had to go there. In short, Terry fans will not be disappointed in this book. It’s easy to read and very enjoyable. I recognized some of my family members in the characters and you just might too.